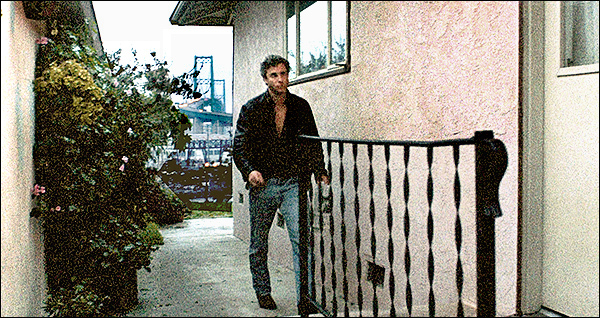 The 1985 movie, "To Live & Die in LA." 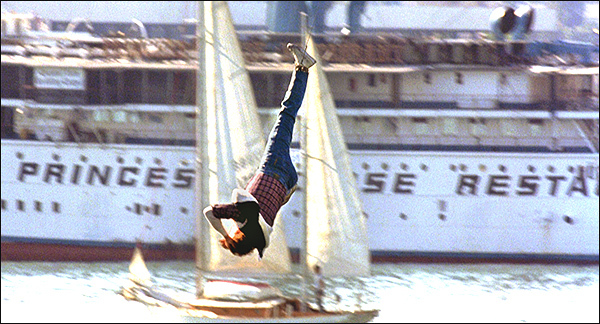 is one of the quintessential Los Angeles films, shot almost entirely in the L.A. area, with dozens of different filming locations around the southland, from the L.A. River to the San Pedro harbor. 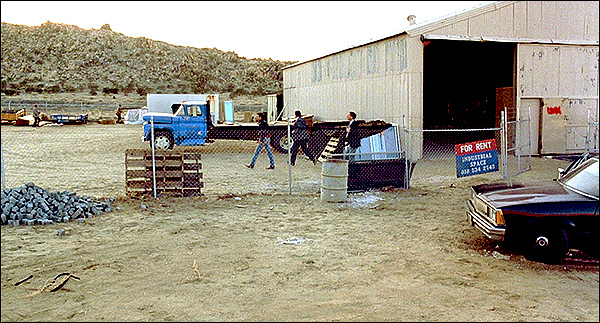 However, one of the problems with doing a locations report on a 1985 movie is that many of the filming locations have disappeared in the intervening decades. But fortunately, quite a few of them still remain. 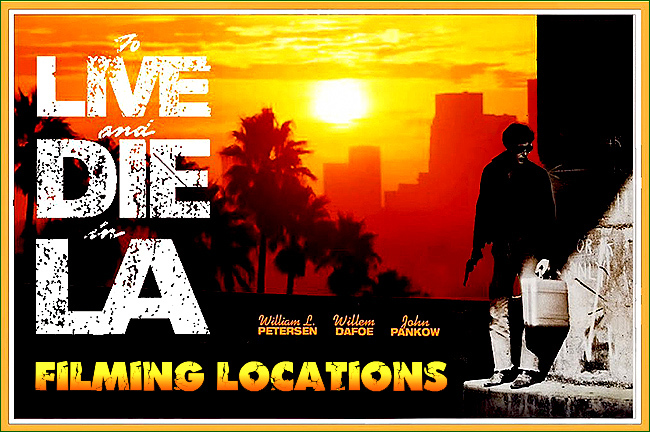 Warning: Due to the gritty nature of this movie, many of the filming locations are located in potentially dangerous parts of L.A. Exercise reasonable caution. 0:00:52: The movie opens with a shot of the Presidential motorcade, as it heads towards the hotel where the President will stay in Los Angeles. 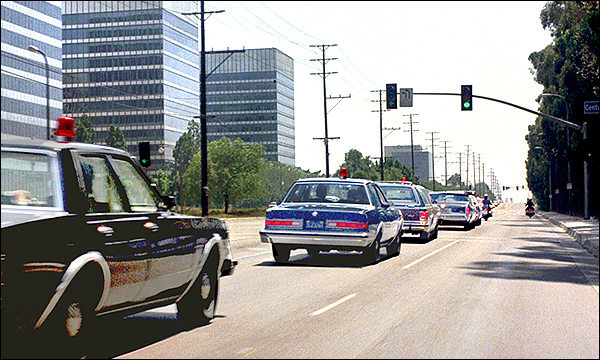 In the screencap above, the motorcade is seen driving west / southwest on Santa Monica Blvd; as they pass Century Park East and the towers of Century City (on the left side). 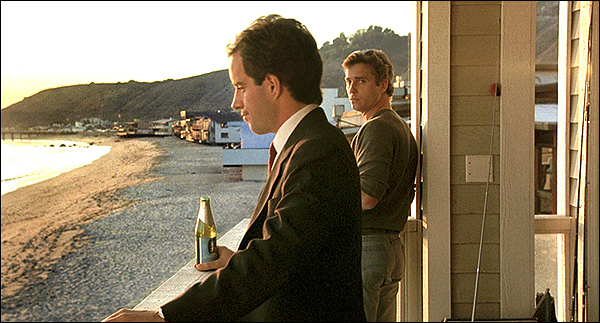 001:37: They wind up at the hotel where the President is staying, and where our hero, Secret Service agent 'Richard Chance' (William Petersen), does his job of protecting the Chief Executive. 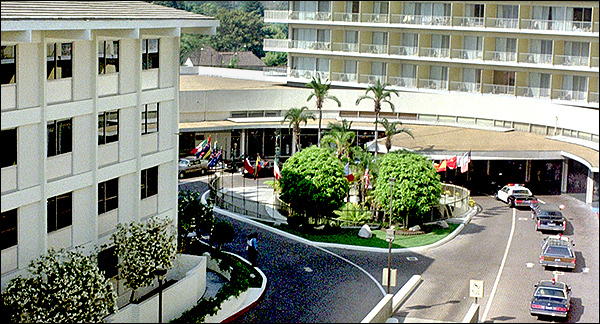 This hotel is actually the Beverly Hilton Hotel, located at the corner of Wilshire Blvd and Santa Monica Blvd, at 9876 Wilshire Blvd, in Beverly Hills. The motorcade turns down (what is now) Merv Griffin Way and winds up at the hotel's circular entrance driveway (which has changed a bit over the years). Here is a Matching StreetView of that driveway. on the roof, where the terrorist blows himself up. 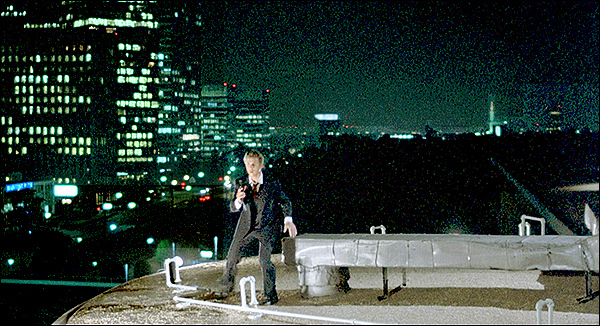 That scene was actually shot on the roof of (the main building of) the Beverly Hilton hotel (the southeast side of that roof, to be exact). 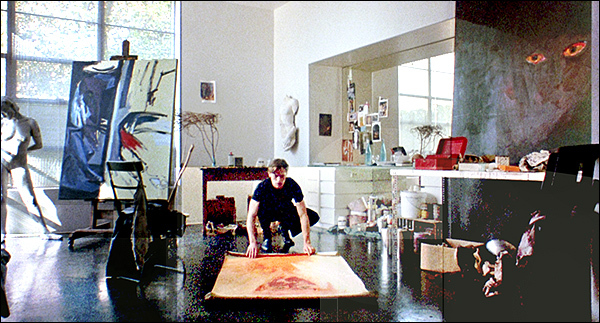 a painting/canvas afire and watch it burn. Here is a StreetView of the house. her husband, Cedric Gibbons (who won 11 Oscars for art direction at MGM). the Vincent Thomas Bridge in San Pedro, arching above the Port of Los Angeles. The bridge links the mainland of the Los Angeles Harbor with Terminal Island. Here is a matching StreetView of the bridge. 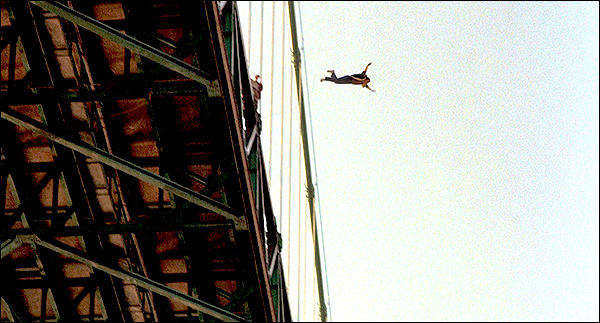 ( As Chance bungee jumps, you can see behind him the S.S. Princess Louise. 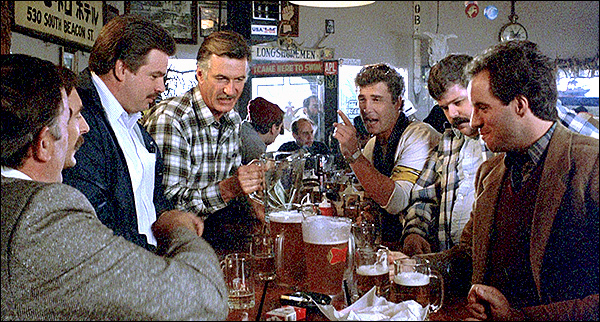 0:10:00: The Longshoreman bar, where Chance gives his partner a fishing rod as a retirement present, was actually Utro's Crest Cafe, which opened in the 1950's on the corner of W. 22nd Street and Mesa, in San Pedro. That is about two miles southwest of the Vincent Thomas bridge, and just a block northwest of the Cabrillo Marina.. When this movie was made, in 1985, it was still there. But the original location was torn down in 1989, and the Cafe eventually relocated to its new location at Berth 73, in the parking lot of Ports O'Call Village, in San Pedro, less than a mile to the northwest.. But the interior of the restaurant at its new location looks more or less the same, its walls still cluttered with the same vintage, seafaring memorabilia. Here is a Google StreetView of the intersection where the café used to be located, back when this movie was filmed. And here is a StreetView of the new location of the same café..
0:18:24 / 22:00: Next, we see the desert warehouse, where Chance's partner, Jim Hart, goes snooping around and is murdered by Masters' men (after he discovers counterfeit money thrown away in the trash bin behind the warehouse). It is located at 40038 170th Street E, in the desert community of Palmdale, in Lake Los Angeles. That's about 80 miles northeast of downtown Los Angeles. It appears to be (or have been) a feed store called “Hitching Post Feed & Pet Supplies”. 170th Street E is where the cars head away at the end of the scene. But the best view is seen looking west from 171st Street, just south of Glenfall Ave. Here is a good Google StreetView of the building, and the familiar rock formations behind it, seen from that spot. The area, which looked completely undeveloped back when the movie was filmed in 1985, has filled in a lot in the intervening decades. There are homes now on the other side of 170th. 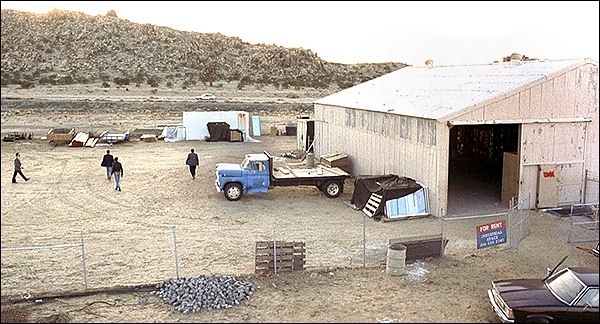 But as of 2015, the barn-like building itself is still very recognizable (although it is now painted red, and they appear to have added a porch to its north side). 0:22:53: We then get to see Chance and his new partner at his house on the beach, talking about how Masters killed his original partner and how Chance is out for revenge. 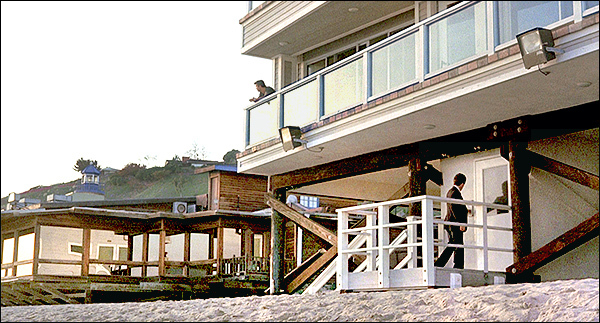 The condo is located right on the beach, at 22664 Pacific Coast Highway, in Malibu, about 760 yards east of the Malibu Pier. Here is a matching StreetView of the beach house. 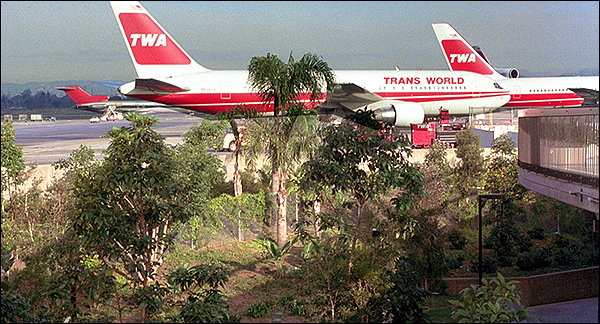 0:22:53: The airport scenes (where Chance spots a counterfeiter passing bad bills at the counter, chases him down, and corners him in a restroom) were shot at LAX (Los Angeles International Airport), west of Inglewood, California. 0:39:56: The church where the cops stake-out Waxman's law office across the street (for surveillance purposes) is, in real-life, the First Congregational Church of Pasadena, at 464 E. Walnut Street, in Pasadena, CA. 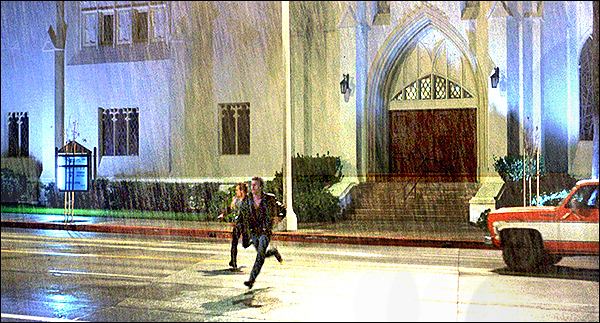 The door seen in the screencap above is located on the west side of the church, and faces N. Los Robles Avenue, not Walnut.. 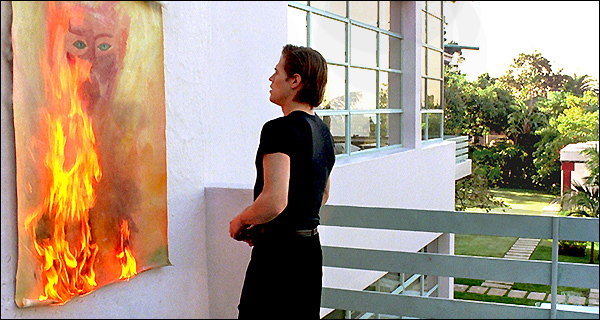 The movie itself gives is the correct location, when chances partner states that:partner states that it's at "the corner of Walnut & Los Robles". Here is a matching StreetView of that west side of the church. 0:42:20: On the way to Ruth's house, we see Chance driving along a curving road at dusk. On his right side are two places with large signs reading "BAIT" and "BAIL". On the left side is the harbor. 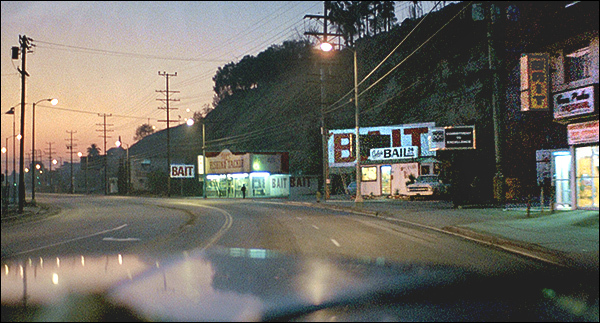 This driving scene was shot on the Wilmington/San Pedro border, down by the docks of the L.A. Harbor. The bend in the street is where John S. Gibson Blvd is renamed N. Pacific Avenue. They are driving south/southeast as they take that turn on Pacific, and are headed towards the Vincent Thomas Bridge. Most of the bait places that lined that stretch of road are gone =now, but the one seen in the screencap above, with the biggest "BAIT" sign (with the smaller "BAIL" sign right beneath it), is still there. It's called Sylvia's Bail Bonds, and you'll find it at 981 N. Pacific Ave, in San Pedro. Here is a matching StreetView of that stretch of Pacific Ave.
0:43:27: Ruth's (Darlanne Fluegel) hilltop house, overlooking the L.A. harbor, was located atop the small but steep Knoll Hill, in San Pedro, just west of the Vincent Thomas Bridge (you can see the bridge in the background as Chance walks to the door). To reach the house, Chance turns up Knoll Hill Street, then turns left on Center Street at the top of the hill, and appears to end up at the east dead-end of Viewland Place. Alas, most of the small homes that used to stand atop this little hill are gone now, including the one where they filmed these scenes. They have been replaced by a new hilltop park, with a number of baseball diamonds. But the view of the bridge and harbor below remains the same. that view of the Vincent Thomas Bridge). that park, but after they had torn down Ruth's little house.